We spend a lot of time on our phones. In line at the grocery store. Waiting for the bus. Sitting at a café. But, more than anything, we’re using them in front of the TV. Research from eMarketer recently found that 177 million adults use their phones while watching TV, marking a 5.1% increase from 2016. While that has big implications if you’re running TV ads, it’s also something that retailers and brands should think about when it comes to the mobile experience. In fact, Criteo’s most recent Global Commerce Review affirms that mobile is no longer a channel – it’s a lifestyle. Shoppers have become more comfortable with making purchases on their phones, with our data showing a 9% increase of total ecommerce transactions completed on smartphones since 2016. It only makes sense that in our increasingly round-the-clock omnichannel world, people are dividing their attentions across multiple platforms at a time, even when they’re watching TV. According to the study, an estimated 177.7 million U.S. adults, or 70.3% of the population, regularly use a second screen device while watching TV. 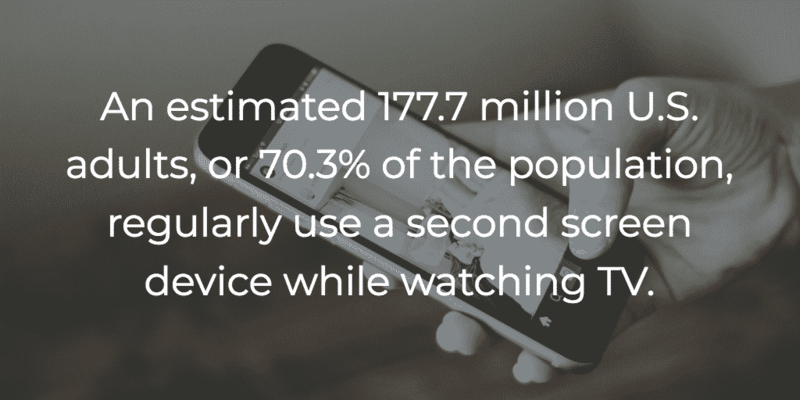 Approximately 26% or 46 million of these “second-screeners” are looking for content related to what they’re watching, but the majority – 131.5 million – are not. These people are texting, shopping, or using social media as they watch TV. For marketers, this presents both challenges and opportunities. How do you reach and engage your customers, regardless of when and which device they’re using? How do you stay front-of-mind and stand out amidst the choices coming from not just one but two or perhaps even three devices? Advertisers are rising to the challenge by exploring screen-agnostic strategies and leveraging their existing creative assets to use across channels and screens, TVs included. Rather than customizing ads for individual platforms, advertisers are creating content that works across platforms to reach their audiences wherever their attention happens to be. Social media channels are exploring longer forms of advertising that were previously thought to be best suited for TV viewing. Twitter, Instagram and Snapchat are now unrolling 30 and 60 second ad-spots for brands looking to push the creative limits of their digital video projects, and brands like Abercrombie and Fitch, with their new 30 and 60-second holiday ad spots, are employing an omnichannel roll-out across all social channels, TV, and even movie theaters. How can social content bring people to turn on the TV? How can TV spots inspire people to engage with brands online or in-store? For the omnichannel shopper, attention – and usually money – goes where the delight is. With channels like Fox leading the way, the line between TV and digital video content will continue to blur. For brands and advertisers, the second-screen marketing opportunities are plenty. Criteo’s Global Commerce Review finds that shoppers in the US are browsing and buying across all environments and more active than ever on mobile. Cross-device shoppers that use different devices to connect with a brand spend an average of 14% more per order. So when you’re marketing to shoppers using second screens, think holistically about marketing campaigns. How does a campaign translate from TV to Facebook? How can you ensure that the content is consistent and relevant at each touchpoint? It all starts with data. Without the right data, you won’t be able to match shoppers that are jumping from device-to-device or switching channels. The retailers and brands that will win in 2018 are leveraging shopper data in new and exciting ways. In our report with Forbes Insights, we surveyed 500+ marketing execs, many who think collaboration is the way forward, especially when competing with tech giants. By working together with pooled data assets, it’s possible to connect with shoppers on any screen, whether it’s a second, third, or twentieth.